JOHN CRUWYS was the eldest son of John Cruwys, Lord of the Manor of Cruwys Morchard, and Elizabeth Whitley. He is believed to have been born around 1480.He had at least two brothers and three sisters. 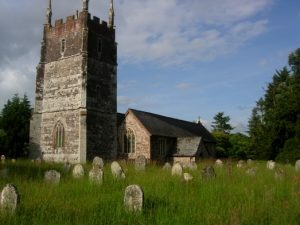 Since his father was already lord of the manor when John was born, he would have grown up at Cruwys Morchard House, beside the church of the Holy Cross, in this sparsely populated parish between Tiverton and Witheridge. In 1485, the House of York fell at the Battle of Bosworth. Henry Tudor took the throne. He had been a supporter of the House of Lancaster in the War of the Roses. John’s grandfather, (or according to earlier pedigrees, his great-grandfather,) Thomas Cruwys, had died in the Lancastrian cause, so the Cruwys family were probably now in better favour with the monarchy. John’s mother seems to have died by the time he was ten. His father remarried. John’s stepmother, Maria Francis, was some 25 years younger than her husband. She would have been a teenager, only a few years older than John, more like an elder sister than a brother. Four more boys were born to add to the family. In 1509, the young king Henry VIII inherited the throne. ‘In mercy’ meant he was subject to a fine. John junior seems to have had his own household and land within his father’s manor. John married about 1514, when he was in his thirties. ALICE AYSHFORD was the daughter of William Ayshford of Burlescombe in East Devon. An IGI entry gives the date of her marriage as 1522 and her estimated birth-date as 1505. But the 1514 date for her marriage to John is given by researchers into the Cruwys family and is likely to be more reliable. Alice was probably born in the 1490s. Her background was similar to John’s. The Ayshfords were the leading family in Burlescombe. The north aisle of St Mary’s church is known as the Ayshford aisle, and contains coloured monuments to 17th century Ayshfords hung on the walls. More significantly, the chancel contains the altar-tomb of William Ayshford, who died in 1508, and his two wives. These are Alice’s parents and her stepmother. Like the later monuments, the tomb is coloured. Around its sides stand ten figures, each beneath a canopy. Before and after their marriage in 1514, feoffees made grants of lands and tenements to the couple. 11 Jan 6 K Hen VIII grant by William Cruwys, Mathew Cruwys, Richard Facye, clerk, & John Gyrnowe at the special desire of John Cruwys, senior, to John Cruwys, junior and Alice Ayssheford who John junior is about to marry, mess. lands and tenements in Cruwys Morchard, Treyhill, Trelane, Parkers, Chapel, Westlane, Meare, More, Kellys & Eggsworthy which Joan Bydegoode, William Ellyston, Thomas Lei, Richard Frost, William Gater, Thomas Chylcote, John Maunder, John Stepheyns and William Skynner now hold separately. William Elyston & John Northcote attorneys. Witnesses: Thomas Stukeley Esq; Nicholas Ayssheford Esq., Thomas Coterell and many others. In the 6th year of K. Hen. VIII possession & seision (?) were received on St Paul’s Day [29th June] according to the effect of this charter before Richard Ayssheford, Nicholas Takyll, William Chapell and others. Nicholas Ayshford, esq, was Alice’s brother. Grant by William Cruwys, Matthew Cruys, Richard Facy, clerk and John Gyrnow (?) [survivors of the before mentioned Thomas Tremayle and others] to John Cruwys, senior, of a mess. called Forde in Morchard Cruwys, a mess. in Baggiston in Rackenford for life. Remainder to John Cruwys junior and Alice Aysshford whom he had married and the heirs of John Cruwys, junior. Witnesses: Thomas Stucley, Esq; Nicholas Ayssheford esq; Thomas Cotterell and others. Grant by above William Cruwys and Mathew Cruwys etc. to John Cruwys Junior and Alice of all mess. in Morchard Cruwys called Trehylle, Trelane, Parkers, Chapel, Westlane, Meare, More, Kellys and Eggeworthy and the heirs of John Cruwys junior. The couple’s eldest son, Thomas, was born about 1516. The dates given for the death of John’s father vary wildly, from Burnet Morris’s 1509 to Margaret Cruwys’s impossible 1558. T.F. Johns has cited documentary evidence to show that it was in or shortly before 1518. John and Alice would have moved into the manor house, if they were not already living there. John’s stepmother remarried and went to live in Landkey, near Barnstaple. She would have taken with her any of her younger children still living at home. It was now John’s turn to preside at the manorial court. He was probably in his late thirties. A second son, John, was born around 1521. There were almost certainly daughters, too. In 1524, the middle of Henry VIII’s reign, we find John’s name on the Subsidy Roll for Witheridge Hundred. For Cruwys Morchard, his is the first of 23 names on the list of taxpayers. He was assessed for an annual income of £26⅔ from goods. The next highest in the parish are two householders at G 16. No one in the parish is assessed for land. But in the parish of Stockleigh English, not far to the south, Agnes Cruys is assessed for income from land of £7. We do not know her relationship to John. About this time, 14th century Church of the Holy Cross, next to Cruwys Morchard House, was destroyed by fire. The chancel, the lower part of the nave walls and the first stages of the tower, with their windows in the decorated style, are all that survived. The church was rebuilt by 1529, and doubtless John helped to fund this. A south aisle was added and there were new windows in the perpendicular style. A large wooden gothic screen separated the chancel from the nave. A flight of steps in the south wall led up to the top of the screen. Some services were conducted from there, but this practice was soon to be swept away, after the Reformation of 1531. The rebuilt tower had a spire, probably of wood, and four bells. Much of this new church and its contents were lost in another disastrous fire in 1689. The family lived through the turbulent times of the Reformation in 1531. In the early 17th century one of their granddaughters was twice jailed for refusing to attend her parish church, which means she was either a Roman Catholic or a Dissenter. Since, later that century, the Cruwys family were Parliamentarians, and related by marriage to Oliver Cromwell’s chaplain, the latter persuasion is more likely. The 16th century Cruwys family may also have had sympathies in the Puritan direction. If so, they would have welcomed the break with Rome, whether or not they fully approved of Henry VIII’s new Church of England. In 1534 the Church House was built on the village green at the west end of the churchyard. John confirmed a grant of land, originally made by his father John Cruwys in 1478. It was for ‘one parcell of land… contayneing in length fifty six foote and in breadth foure and twenty foote, lyeing in the South side of one meadow called Culver Parke meade and on the North sie of a pece of ground called the greene… under the yearely rent of fower pence’. The feoffees were to erect a dwelling house on this piece of land by Michaelmas 1534, which they did. It was a two-storeyed building. During its lifetime the house was put to many and varied uses. “Upon holy daies” the Churchwardens “kept Church ales” there and the profit made from the sale of such ales was used for the benefit of the poor. It was used also for meetings, housing the parish arms, securing prisoners, and at times the Manor Courts were held there. In 1542, when John was in his sixties, the Lay Subsidy for Cruwys Morchard, again assessed him for taxation: John Cruse in Goodds xxj s vii d.
By now, he was certainly in good standing with the Tudor royal family. In 1545 Henry VIII’s sixth and last queen, formerly Katherine Parr, ordered ‘one Buck in Season, to be taken as our gyffte owte of owre Park in Ockhampton’ and given to ‘our trusty & well-beloved servant John Cruisse of Crusham Orcharde’. The country, and particularly the county of Devon, was again subject to religious upheaval in the Prayer Book Rebellion of 1547. It was provoked by the reforms of Thomas Cranmer, who had the approval of the boy king, Edward VI. They removed many of the Catholic and High Church practices of the Church of England. The rebellion was crushed, and its leaders executed. Many of the reforms were reversed with the succession of the Catholic Mary Tudor in 1553. In a charter dated 14 March 1556/7, the Cruwys premises at Great Anstey were passed to John’s eldest son. By another, dated 3 Dec 1558, the estates at Morchard Cruwys, Wasshefylde and Throwleigh also passed to John junior. By now, his eldest son, Thomas, was dead. The manor passed to his second son John. The remainder of the information comes from Johns, unless otherwise stated. In many cases he provides primary source references. W.G. Hoskins, Devon, (David and Charles, 1972), pp.358-9.